Positioning systems based on location fingerprinting have become an area of intense research, mainly with the aim of providing indoor localization. Many challenges arise when trying to deploy location fingerprinting to an outdoor environment. The main problem is achieving coverage of large outdoor spaces, which needs an intensive data gathering effort. This paper proposes the use of mobile crowdsensing in order to build a fingerprint database consisting of Wi-Fi networks received signal strength measurements. Mobile crowdsensing is represented by the usage of smart-phones equipped with GPS and Wi-Fi sensors for the collection of fingerprints. The primary objective of this work is to prove the feasibility of urban positioning using Wi-Fi crowdsensed data by showing that Wi-Fi networks are ubiquitous in urban areas. We then examine the gathered data and report our findings on challenges in building and maintaining a large-scale fingerprint database, the influence of the data collection method on the Wi-Fi data and the influence of fading on measurements. As Wi-Fi access-points are shown to exhibit mobility, we also propose and analyze methods for detecting and classification of mobile and static access-points. C. L. Leca, I. Nicolaescu, C. I. Rincu, and F. Popescu, "Determining optimum base stations configuration for TOA localization inside celullar networks," in Communications (COMM), 2016, pp. 233-236. B. Wang, Q. Chen, L. T. Yang, and H.-C. Chao, "Indoor smartphone localization via fingerprint crowdsourcing: challenges and approaches," IEEE Wireless Communications, vol. 23, no. 3, pp. 82-89, 2016. J. Niu, B. Wang, L. Cheng, and J. J. Rodrigues, "Wicloc: An indoor localization system based on wifi fingerprints and crowdsourcing," in Communications (ICC), 2015 IEEE International Conference on. IEEE, 2015, pp. 3008-3013. Z. Li, A. Nika, X. Zhang, Y. Zhu, Y. Yao, B. Y. Zhao, and H. Zheng, "Identifying value in crowdsourced wireless signal measurements," 2017. A. Sebbar, S. Boulahya, G. Mezzour, and M. Boulmalf, "An empirical study of wifi security and performance in morocco-wardriving in rabat," in Electrical and Information Technologies (ICEIT), 2016 International Conference on. IEEE, 2016, pp. 362-367. T. Wigren, Y. Jading, and C. Tidestav, "LTE fingerprinting positioning references for other cellular systems," Mar. 19 2013, US Patent 8,401,570. C. Wu, Z. Yang, and Y. Liu, "Smartphones based crowdsourcing for indoor localization," IEEE Transactions on Mobile Computing, vol. 14, no. 2, pp. 444-457, 2015. Y. C. Cheng, Y. Chawathe, A. LaMarca, & J. Krumm, "Accuracy characterization for metropolitan-scale Wi-Fi localization" Proceedings of the 3rd international conference on Mobile systems, applications, and services, 233-245, ACM. B. Li, I. J. Quader, & A. G. Dempster, "On outdoor positioning with Wi-Fi". Positioning, 1(13), 2008. D. Wu, Q. Liu, Y. Zhang, J. McCann, A. Regan, and N. Venkatasubramanian, "Crowdwifi: efficient crowdsensing of roadside wifi networks," in Proceedings of the 15th International Middleware Conference. ACM, 2014, pp. 229-240. L. Rogoleva, "Crowdsourcing location information to improve indoor localization," 2010. T. Gallagher, B. Li, A. G. Dempster, and C. Rizos, "Database updating through user feedback in fingerprint-based wi-fi location systems," in Ubiquitous Positioning Indoor Navigation and Location Based Service (UPINLBS), 2010. IEEE, 2010, pp. 1-8. A. Farshad, M. K. Marina and F. Garcia, "Urban WiFi characterization via mobile crowdsensing," 2014 IEEE Network Operations and Management Symposium (NOMS), Krakow, 2014, pp. 1-9. P. Sapiezynski, R. Gatej, A. Mislove, and S. Lehmann, "Opportunities and challenges in crowdsourced wardriving," in Proceedings of the 2015 ACM Conference on Internet Measurement Conference. ACM, 2015, pp. 267-273. K. Kaemarungsi, "Distribution of WLAN received signal strength indication for indoor location determination," in Wireless Pervasive Computing, 2006 1st International Symposium on. IEEE, 2006, pp. 6-pp. E. Laitinen and E. S. Lohan, "On the choice of access point selection criterion and other position estimation characteristics for wlan-based indoor positioning," Sensors, vol. 16, no. 5, p. 737, 2016. F. Karlsson, M. Karlsson, B. Bernhardsson, F. Tufvesson, and M. Persson, "Sensor fused indoor positioning using dual band wifi signal measurements," in Control Conference (ECC), 2015 European. IEEE, 2015, pp. 1669-1672. J. Luo and X. Zhan, "Characterization of smart phone received signal strength indication for wlan indoor positioning accuracy improvement." JNW, vol. 9, no. 3, pp. 739-746, 2014. C. Laoudias, D. Zeinalipour-Yazti, & C. G. Panayiotou. "Crowdsourced indoor localization for diverse devices through radiomap fusion". In Indoor Positioning and Indoor Navigation (IPIN), 2013 International Conference on (pp. 1-7). IEEE. K. Kaemarungsi and P. Krishnamurthy, "Properties of indoor received signal strength for WLAN location fingerprinting," in Mobile and Ubiquitous Systems: Networking and Services, 2004. MOBIQUITOUS 2004. The First Annual International Conference on. IEEE, 2004, pp. 14-23. P. Mirowski, P. Whiting, H. Steck, R. Palaniappan, M. MacDonald, D. Hartmann, and T. K. Ho, "Probability kernel regression for wifi localisation," Journal of Location Based Services, vol. 6, no. 2, pp. 81- 100, 2012. 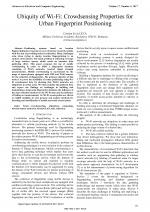 J. Goldhirsh and W. J. Vogel, "Handbook of propagation effects for vehicular and personal mobile satellite systems," NASA Reference Publication, vol. 1274, pp. 40-67, 1998. P. Sapiezynski, A. Stopczynski, R. Gatej, & S. Lehmann. "Tracking human mobility using wifi signals". PloS one, 10(7). C. L. Leca, L. Tuta, I. Nicolaescu, C. I. Rincu. "Recent advances in location prediction methods for cellular communication networks". In Telecommunications Forum Telfor (TELFOR), 2015 23rd (pp. 898-901). IEEE. 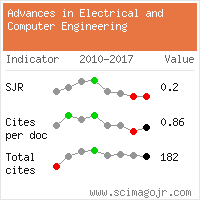 Citations for references updated on 2019-04-20 16:23 in 163 seconds.